Deluxe Edition includes the Versatility Battlepack, Precision Battlepack and Suppression Battlepack - all featuring unique assault rifles, weapon camos and XP boosts. Lead your crew as detective Nick Mendoza in an episodic crime drama single player Campaign or as cops and criminals in intense high-speed Battlefield multiplayer. You’re on one side of the law or the other - time to hit the streets. More money, more problems. Take control using new tactics to gather intel, obtain warrants and takedown with non-lethal force to make his arrests. Secure the cash in a thrilling new battlefield playground. Fulfill your need for speed in thrilling new action packed modes that make for intense and fluid gameplay. Hop in new powerful muscle cars, sleek bikes or even give your whole crew a lift in transport or armored trucks. New maps and gadgets change the way you play. Use grappling hooks and ziplines to scale city buildings and zip across the city with the cash. No matter the strategy, teamwork will be essential to running the turf war. THE DEPICTION OF ANY WEAPON OR VEHICLE IN THIS GAME DOES NOT INDICATE AFFILIATION,SPONSORSHIP OR ENDORSEMENT BY ANY WEAPON OR VEHICLE MANUFACTURER. 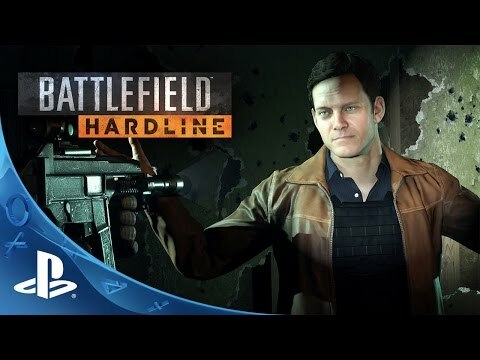 © 2014 Electronic Arts Inc. Battlefield, Battlefield Hardline, Frostbite and the DICE logo are trademarks of EA Digital Illusions CE AB. EA, the EA logo, Visceral Games and the Visceral logo are trademarks of Electronic Arts Inc.